In the color and appearance measurement industry we like to use the phrase “correlate to the visual” when describing measurements. This means that instruments that measure appearance properties should give data that supports what we see with our eyes. If a transparent sample A appears twice as hazy as sample B, a haze meter used to measure both samples should give a number that is twice as large for sample A as for sample B. If sample A appears to be redder than sample B, and both samples are measured with a spectrophotometer and the colors given as CIEL*a*b* coordinates, sample A should have a higher a* value than sample B. From an engineering standpoint however, correlating measured values with what we see visually is not an easy thing to do. In order to build instruments that measure color and appearance properties in the same way that the human eye sees those properties, we must first understand how the human eye works. 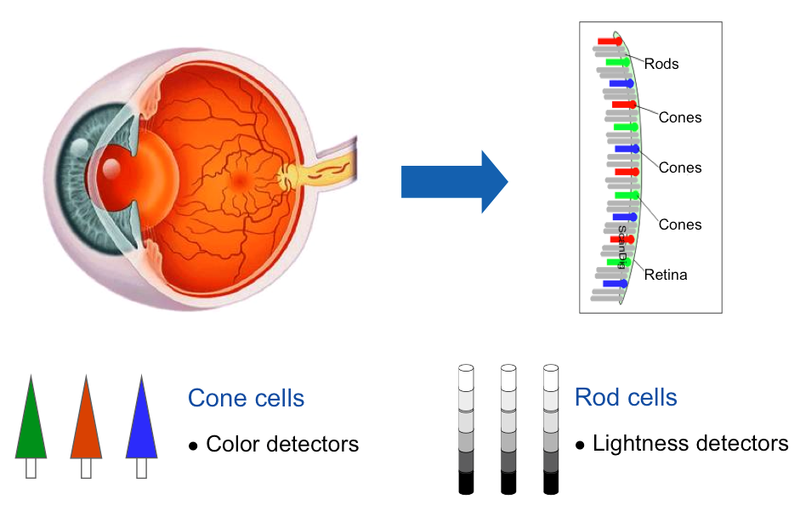 Cones and rods in the human eye. Photo Courtesy of BYK-Gardner USA. The human eye is designed to detect electromagnetic radiation in the range of approximately 400-700nm, commonly called “visible light”. There are two mechanisms in our eyes for doing this: rods that detect varying levels of light and are responsible for our perception of lightness and darkness; and cones that detect varying wavelengths of light and are responsible for our perception of color. 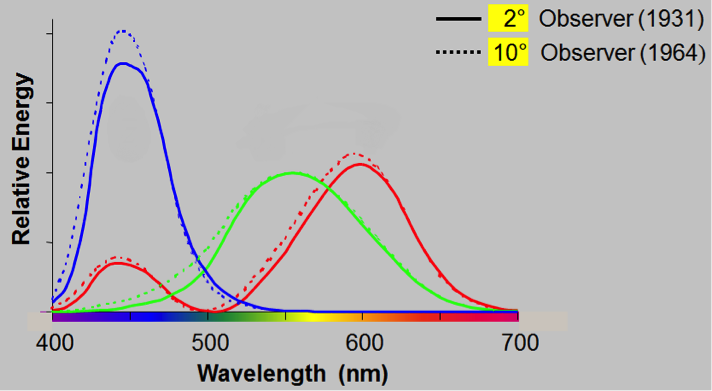 In order to create an instrument that can accurately measure color it is necessary to simulate a human observer by accurately reproducing the response of these two mechanisms to light. The first standardized observer was developed in 1931 and simulated a cone of light entering the eye at a 2° angle, as shown below. It was later discovered, however, that the 2° observer when used in color measurement does not correlate very well to what the human eye sees, thus the 10° observer was developed to more accurately reproduce color vision. In this case a 10° cone of light enters the eye as shown below, accessing more of the eye’s cones and rods. 2° and 10° Standard Observer. Spectral Response Curves for the three types of cones. The response for the 2° observer is given by the solid curves, while the response for the 10° observer is given by the dotted curves. Based on this we can see that the 10° observer has higher sensitivity than the 2° observer, making for more accurate color measurement. So what do these curves mean? Let’s take the dotted blue curve, representing the response of the blue cones in our eyes. We can see that the curve peaks at around 450nm, meaning our blue cones are most sensitive to light of this wavelength. The curve slopes downard on either side of this peak, such that the sensitivity to light at 420nm is about half as much as that at the peak. This means that if our eyes were to receive an equal amount of 420nm and 450nm light, it would appear to us as if we were seeing twice as much of the light at 450nm as at 420nm. In this way, the light received by our eyes is “weighted” by how sensitive our cones are at each wavelength. Now that we understand how the human eye perceives color, we can talk about how color measurement devices duplicate this feat. 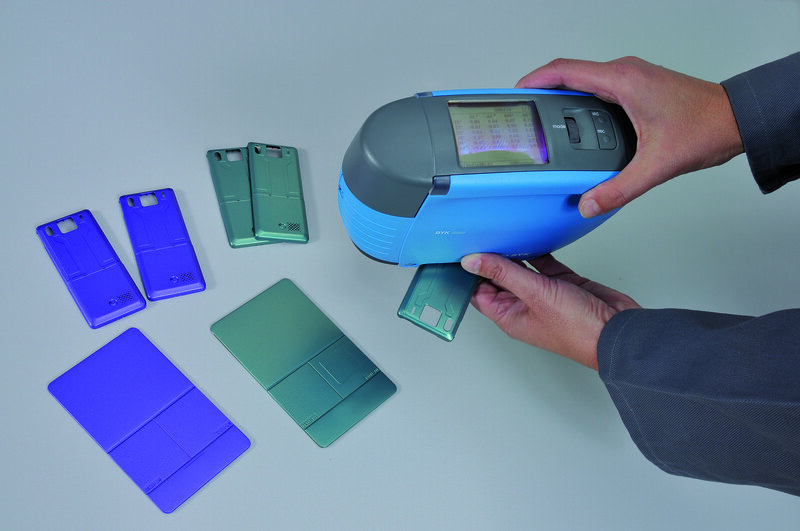 There are three main components to color perception: an illuminant, an object, and a detector. Without getting too technical, color measurement works like this: a color measurement device illuminates the object being measured with white light made up of a spectrum of wavelengths from about 400 to 700nm. For each wavelength, the object absorbs some of the light and reflects the rest depending on its color. The detector in the color measurement device then senses how much light of each wavelength is reflected by the object. This data is represented by a spectral reflectance curve. This curve is then weighted according to the response curves of the red, green, and blue cones shown above, and converted into color values such as CIEL*a*b* or the tristimulus values XYZ. This is how the standard observer is used to correlate color measurement to what we see visually; the weighting of the spectral reflectance curve according to the spectral response curves of the cones in our eyes allows the color instrument to measure color as we see it. This allows us to build color instruments that truly correlate with the visual.